2411 Grapevine Cross  - $9.50 : Red Bird Mission Crafts, Hand crafted art. 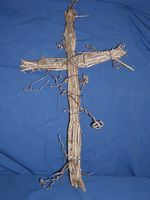 This cross is made from grapevines and wires. The 10 wires stand for the 10 Commandments. The ends are broken because Jesus' body was broken for us. The cross is rugged because Jesus died on the old Rugged Cross. The cross is empty because Jesus got up and walked on the third day. Meaning we can be Redeemed because of the cross and the tomb being empty!